Jim Osborne and Donnie Johnson impart their wisdom and perspective to seniors preparing to graduate high school. 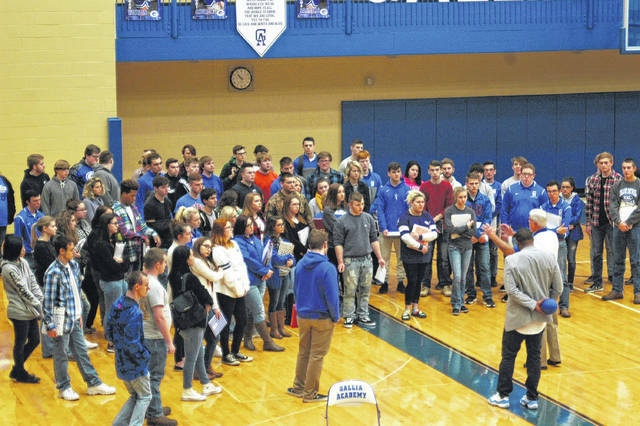 CENTENARY — Gallia Academy Seniors recently had two visitors, Donnie Johnson and Coach Jim Osborne met with the graduating class of 2018 to impart wisdom and perspective as the students go out into the world. Osborne was the head basketball coach at Gallia Academy for 41 years, and currently teaches at the University of Rio Grande. Johnson was a 2004 graduate of Gallia Academy and is remembered for his performances on the basketball court and the football field. Johnson and Osborne set up chairs in the gymnasium representing different stages of life, including high school, post high school career options, retirement, and end of life care. Everyone in the gym lined up near the chair that represented where they are in life. Osborne, a 1963 high school graduate was farther along than others, giving his perspective to the seniors. Osborne explained how dealing with the loss of his parents and helping his wife deal with the same were difficulties he never thought he would have to deal with. This perspective gave him the genuine desire to tell his father he loved him one more time. Johnson currently works for Marathon Petroleum managing transport operations, an uncommon career for someone from rural Appalachia. The major emphasis from Osborne and Johnson was perspective, offering theirs to a group of young people that are single minded in their focus to graduate high school. Johnson, a current resident of Findlay, Ohio drove four hours in the snow to talk with the students. “I like seeing the look on kids faces when somebody says ‘they believe in me, I can do it, I can be somebody,’” said Osborne. Gallia Academy started asking alumni and community members to come in and speak to seniors throughout the year instead of just during graduation. Principal Josh Donley explained that this gives speakers an hour several times during the school year to pass on wisdom and perspective for the students.